Everyday Wear Shirt — $15.00 ea. The everyday shirt from Next Level in Bondi Blue is lightweight and comfortable at 4.3 oz 60% combed ring-spun cotton / 40% poly blend. It is perfect for traveling to a race, packet pick-up, post-race, volunteering, or representing L.O.U.D. as part of your everyday wear. Tech Tee — $15.00 ea. The tech tee from Zorrel comes in azure and is a 4.1 oz 100% microfiber polyester with a UPF 30+ sun protection rating. The men's shirt is a standard tee while the women's shirt has a V-neck. This shirt is perfect for training and racing. Unisex Lightweight Hoodie — $25.00 ea. The perfect pull-over hoodie for cooler race mornings, comfortable air travel, and post race warmth. This is a super-light 4 oz tri-blend hoodie made of 46% polyester, 27% cotton, and 27% rayon. 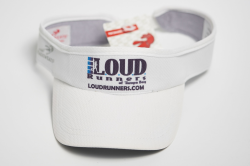 Headsweats Visor — $20.00 ea. These performance visors feature Eventure™ fabric that keeps your head cool and dry during your training runs. Includes velcro adjusting strap to provide a comfortable "just right" fit for even your longest runs. Women's Burnout Racerback Tanks — $20.00 ea. The Women's Burnout Racerback tank comes in Tahiti Blue and Dark Gray. It is lightweight and comfortable at 3.7 oz 65% poly 35% combed ring-spun cotton. It is ideal for those long training runs in the summer.